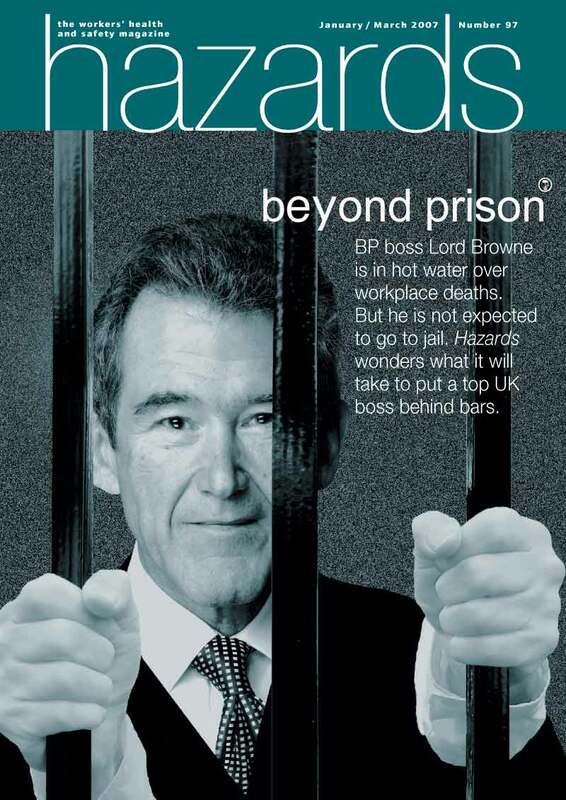 BROWNE STUFF In 2007, Hazards magazine suggested BP's Lord Browne should be behind bars. Now he's the UK's unelected Czar. The scope of the peer’s shake-up of government will include all ministries, including those responsible for workplace and environmental safety and the energy industry. The Conservative Party, which leads the UK’s coalition government, is wedded to the idea of a business-friendly, “burden” lifting, programme of deregulation. The coalition has already embarked on a review of health and safety regulation, and a Conservative policy paper pre-election promised “the powers of government inspectors will be drastically curbed”, adding the party’s objective was “taming regulators” by “replacing regulator-run public teams of inspectors with a model closer to financial controls and audits.” In the UK, far and away the two biggest regulators are the Environment Agency and the Health and Safety Executive (HSE). The model is, in effect, that secured by BP and other oil interests in the Gulf of Mexico, where firm regulation was sacrificed in favour of paper agreements and oil industry self-regulation. The worker safety standards in place for offshore oil rigs before the Deepwater Horizon blast were voluntary and developed in consultation with the oil industry, a senior official at the retooled Minerals Management Service (MMS) – in a seemingly premature move renamed last month as the Bureau of Ocean Energy Management, Regulation and Enforcement – admitted to US lawmakers on 23 June. Doug Slitor, now the acting chief of offshore regulatory programmes at the reorganised agency, told members of the House Education and Labor Committee that his office is working to turn the worker safety guidelines – drafted with the oil industry lobbying group the American Petroleum Institute – into a mandatory programme. Rep. George Miller, chair of the House Education and Labor Committee, commented that BP was “a multinational corporation with a dismal safety record in this country.” A share of the more egregious crimes occurred while the company was under the direction of Lord Browne – Tony Hayward took over the reins in 2007. Questions have already been raised about the company’s safety record in the UK, where the troubled oil giant has been caught breaking health and safety regulations 54 times over the past five years. Health and Safety Executive (HSE) enforcement database show the official action against the British multinational relates to a series of maintenance and operating lapses which put workers and the environment at risk from major leaks, fires and accidents in the North Sea and elsewhere. As a result HSE has served BP companies with 21 legal enforcement notices since 2006, requiring lax and dangerous practices to be improved. The company, however, has not been prosecuted by the watchdog since 2005. This entry was posted in Uncategorized and tagged BP, Deepwater Horizon, deregulation, John Browne, Lord Browne, oil industry, regulation. Bookmark the permalink. Post a comment or leave a trackback: Trackback URL.